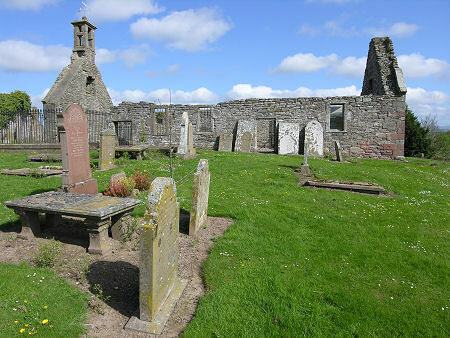 Eassie Old Parish Church and Churchyard stands just to the north of a loop of minor road serving Eassie Farm off the A94 two miles west of Glamis. The ruins of the old church and the churchyard that surrounds it are well worth seeing in their own right, but the main attraction must surely be the magnificent Pictish cross slab on display here. The interior of the cross is filled with intricate interlaced patterns. 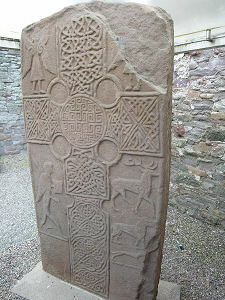 The four corners of the stone, outside the cross, carry a series of further carvings. Top left is a nicely detailed angel, which is mirrored top right, though here much of the angel has been broken away by damage to the stone. The bottom right quadrant of the cross carries a series of animals above one another. From top to bottom these are a beautifully detailed stag, a "beast" (ie an unidentified idealised animal) and a hound. Bottom left of the cross is the fairly large carving of a hunter wearing a cloak and carrying a shield and a spear. 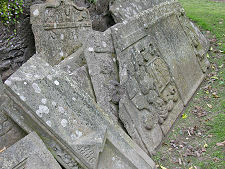 The rear of the cross slab is more eroded and damaged than the front. 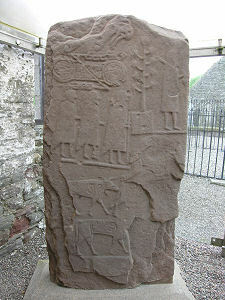 The left side of the upper part of the stone carries two Pictish symbols, an "elephant" and a double-disc and Z-rod. Below these are the figures of three Picts wearing cloaks and carrying spears. The right side of the upper part of the rear of the stone is carved with what seems to be a tree standing in a pot and another Pict with cloak and spear. The further down the stone you go, the more damaged its surface becomes, but the left side of the lower part seems to carry carvings of a number of cows, whose outlines are filled by intricate designs. The middle right of the rear of the stone carries what might be a horseshoe design. 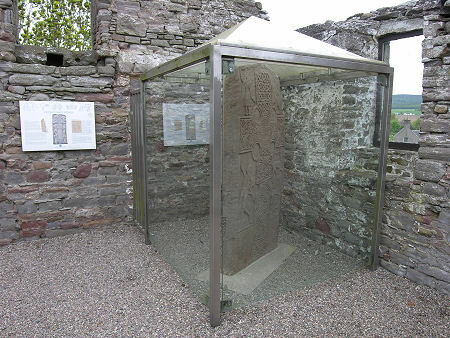 The Eassie Cross Slab is thought to have been carved in the 700s or 800s and parts of the carving are very reminiscent of figures and symbols found on Pictish stones in Aberlemno Kirkyard and at Meigle Museum. 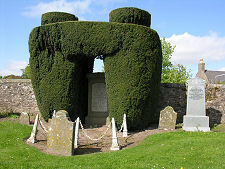 Eassie Old Church, in which the cross slab stands, was dedicated in 1246 by Bishop David of St Andrews and in 1309 it was granted to Newbattle Abbey. Elements of the original church remain, but much of it seems to have been rebuilt in the late 1500s. The Parish of Eassie was combined with a neighbouring parish in 1600, and in 1835 the two churches serving the parish were replaced by a single larger one serving the whole parish. 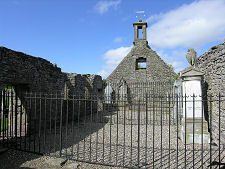 Since then Eassie Old Parish Church has stood derelict. 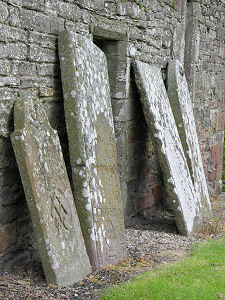 The surrounding churchyard is home to many fascinating old gravestones. 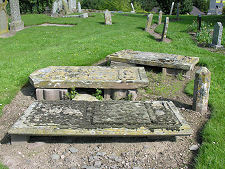 These include a series of tablestones, whose legs have been laid on their sides, presumably on health and safety grounds, and others still standing in their original locations in the churchyard or leaning against the walls of the church. 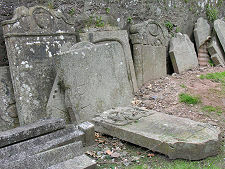 It is a little sad, however, to find that even here there are piles of old gravestones lying, whole or in pieces, against parts of the surrounding churchyard wall. Future generations will look back on today's all too common mistreatment of old gravemarkers in much the same way we now view the activities of our ancestors who broke up Pictish symbol stones for use in field walls. It is ironic to find that even here, where so much effort has been taken to preserve the future of one important stone, others which should be seen as nearly as important have been neglected.